Amateur bakers from Bolton and beyond put on their aprons and whipped up some cake sensations for the Big Bolton Charity Cake Bake at Laserase Bolton on Saturday 15 October. Dorret Conway, one of the participants in this year’s Great British Bake Off, was one of the judges for the competition, along with Janet Marshall, cake development expert at Park Cakes in Bolton, and Keith Wallis, Senior Head Chef at the four star Holiday Inn Bolton Centre. 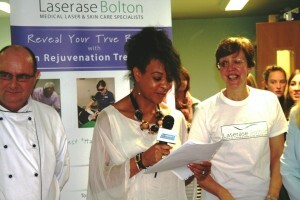 The event was organised to raise awareness of Polycystic Ovary Syndrome (PCOS) and to raise money for national charity Verity – which supports women whose lives are affected by Polycystic Ovary Syndrome – and the Gynaecology and Dermatology departments of the Royal Bolton Hospital, which help women with this syndrome. There were five categories in the Big Bolton Charity Cake Bake: the Best Decorated Cake Award; the Tastiest Cake Award; the Most Creative Cake Award; the Young Baker Award and the Biggest Cake Catastrophe Award. There was also a Best Cake in the Competition Award. Dorret Conway announced the results and prizes included afternoon tea for two at Slattery’s, a family run patissier and chocolatier in Whitefield, and dinner for two at the Holiday Inn Bolton Centre. An auction for a cake baked specially by Dorret, covered in cute white chocolate frogs, raised £50. Park Cakes kindly donated a superb cake for the charity raffle promoting PCOS, which was won by the hospital, and 2chefspassion donated a wonderful cake for the ‘guess the weight of the cake’ competition, which was won by 12 year old Abbie, who guessed 2.2kg when the weight was 2.3kg The cake bake was followed by a charity cake sale and afternoon tea. Polycystic Ovary Syndrome (PCOS) is a common condition that affects millions of women. The symptoms of PCOS include ovarian cysts, irregular periods, difficulty getting pregnant, weight gain, excessive hair growth on the face and body, hair loss from the head, acne and the increased risk of getting certain types of cancer. 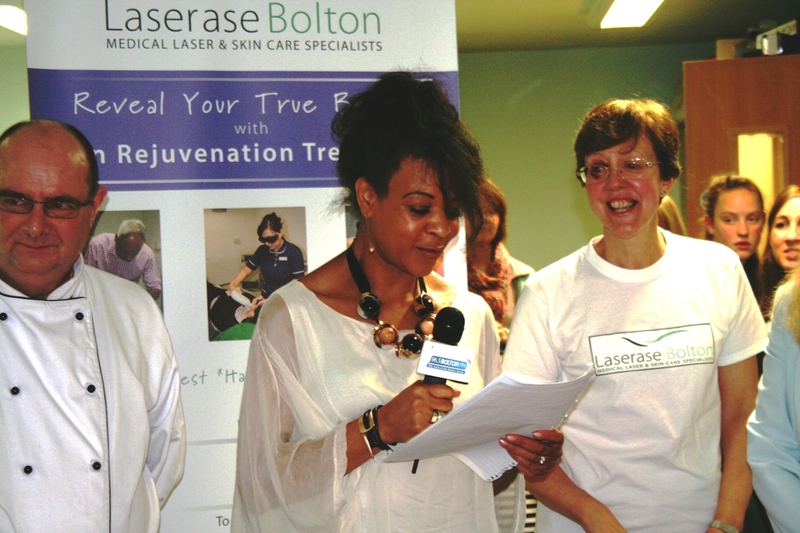 Laserase Bolton is one of the leading laser clinics in the North West of England and has been established for over 20 years. It offers a range of treatments for PCOS sufferers, including laser hair reduction for treating excessive hair growth using the Soprano XL laser, and a number of treatments for managing acne, including NLite laser, AFT 420 pulsed light and medical skin peels. The clinic also offers a number of treatment products to ensure optimum results. All treatments are carried out by highly-experienced medical professionals following a free, no-obligation consultation. To find out more about Polycystic Ovary Syndrome and the help available please visit www.verity-pcos.org.uk. There are also a number of informal local support groups around the country for women with PCOS to make contact with others in their area. The nearest local group to Bolton is in Manchester. To find out when and where they meet, or for information on other local support groups, email localgroups@verity-pcos.org.uk. This entry was posted in Charity, Events, Laserase Bolton and tagged Big Bolton Charity Cake Bake, Dorret Conway, Laserase Bolton, Polycystic Ovary Syndrome on October 15, 2015 by Ethos public relations news. The judges have been revealed for the Big Bolton Charity Cake Bake, which takes place at Laserase Bolton on Saturday 10th October. Dorret Conway, one of the participants in this year’s Great British Bake Off, will lead a team of three judges, which also includes Janet Marshall, cake development expert at Park Cakes in Bolton, and Keith Wallis, Senior Head Chef at the four star Holiday Inn Bolton Centre. The Big Bolton Charity Cake Bake and Cake Sale takes place at Laserase Bolton, opposite the ambulance station on the Royal Bolton Hospital site, on Saturday October 10th from 2.00pm to 4.30pm. It aims to raise awareness of Polycystic Ovary Syndrome (PCOS) and to raise money for national charity Verity – which supports women whose lives are affected by Polycystic Ovary Syndrome – and the Gynaecology and Dermatology departments of the hospital, which help women with this syndrome. Born in Preston to Jamaican parents, 54 year old Dorret Conway is a self-confessed foodie. Brought up on authentic Jamaican cooking meant a very limited exposure to cakes and desserts, so learning to bake at school opened up a whole new world for Dorret and has continued to be a major part of her life. Dorret works as an accountant and her dream is to go to the Cordon Bleu School in Paris and to have a career in food. To kick start this new direction in her life, Dorret is available to run baking parties locally and is always happy to give talks on cooking. Janet Marshall has worked for Park Cakes since 1987, mainly in product development, developing cakes and desserts for Marks and Spencer. Before moving to Park Cakes, Janet worked in a small craft bakery making wedding cakes and novelty birthday cakes. Janet has travelled America and Europe seeking new and exciting cake ideas, and has spent the last 28 years innovating and launching various cakes for all of the major multiple retailers. Janet has always had a passion for baking and has a food science degree from Manchester University. Keith Wallis first trained to be a chef at South Trafford College and, after qualifying, has had a varied career, working in all types of hotel and restaurant. He has spent the last 20 years plus working at different Holiday Inns around the country. He now works at the Holiday Inn Bolton Centre, where he has put his years of experience to good use, developing a friendly and professional team. Keith was instrumental in bringing the Afternoon Tea to Holiday Inn Bolton Centre, which has been a great success. There are four categories open to everyone in the Big Bolton Charity Cake Bake: the Best Decorated Cake Award; the Tastiest Cake Award; the Most Creative Cake Award and the Biggest Cake Catastrophe Award. There will also be a Best Cake in the Competition Award. As the charity’s colour is purple, bakers might like to incorporate some purple into their entry, but this is not obligatory. Entry costs £5 for adults and £2.50 for children. The Cake Bake judging will be followed by a cake sale to raise much-needed funds for the charities and refreshments will be available, so if you can’t bake, you can buy instead. Julie Kershaw, Clinic Manager at Laserase Bolton, says: “We’re hoping that lots of people will come along to the Big Bolton Charity Cake Bake on Saturday 10th October with their home baked masterpieces (or catastrophes!) for this fun and worthwhile event and to meet our judges, who are looking forward to tasting lots of delicious cake creations!” To sign up to the Big Bolton Charity Cake Bake and to make a donation visit: http://uk.virginmoneygiving.com/team/bigboltoncharitycakebake or contact Laserase Bolton for an application form on 01204 570900 or email admin@laserase-bolton.co.uk. Cakes should be dropped off at Laserase Bolton, 71 Redgate Way, Farnworth, Bolton, BL4 0JL (on the Royal Bolton Hospital site opposite the ambulance station) between 11.30am and 1.30pm on the day and must include a label with your name and telephone number and the category in which you are entering. The event will be open to the public from 2.00pm and the winning cakes will be announced around 3.00pm. This will be followed by a charity auction of the winning cakes and a sale of the other cakes. This entry was posted in Charity, Laserase Bolton and tagged Big Bolton Charity Cake Bake, Dorret Conway, Laserase Bolton, Polycystic Ovary Syndrome on September 29, 2015 by Ethos public relations news.